I started working in the Archive at the Institute of Education on Friday 1st April on a project to catalogue the records of the National Union of Women Teachers (NUWT). The NUWT Archive is the largest deposited collection held at the Institute and my job is to catalogue 370 boxes which relate to all areas of the NUWT’s work. The project is funded by the National Cataloguing Grants Programme for Archives, the History of Education Society and the Friends of the Newsam Library and Archives. The NUWT was founded in 1904 as the Equal Pay League and in 1906 it was re-named the National Federation of Women Teachers. 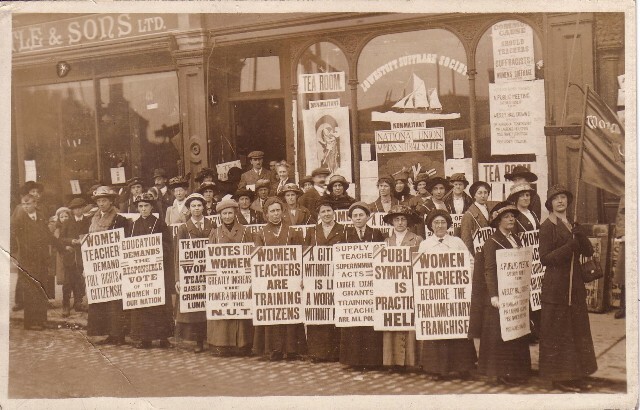 In 1920 it broke away to form an independent union, the National Union of Women Teachers. The main aim of the NUWT was to obtain equal pay for woman and when this was achieved in 1961 the Union wound up. However as I’m very quickly finding out for myself, equal pay was not the only subject which interested the NUWT. In my first week I’ve already catalogued material covering a huge variety of subject, including: the standards of education and provision of services in what were then known as ‘Special Schools’; decisions made to accommodate male teachers returning from the Second World War which privileged their right to work over that of women teachers; the teaching of Domestic Science in schools and experiments to teach boys cooking, and girls woodwork, which seemed to have been very successful; and the impact of various Education Acts, particularly the 1944 Act. 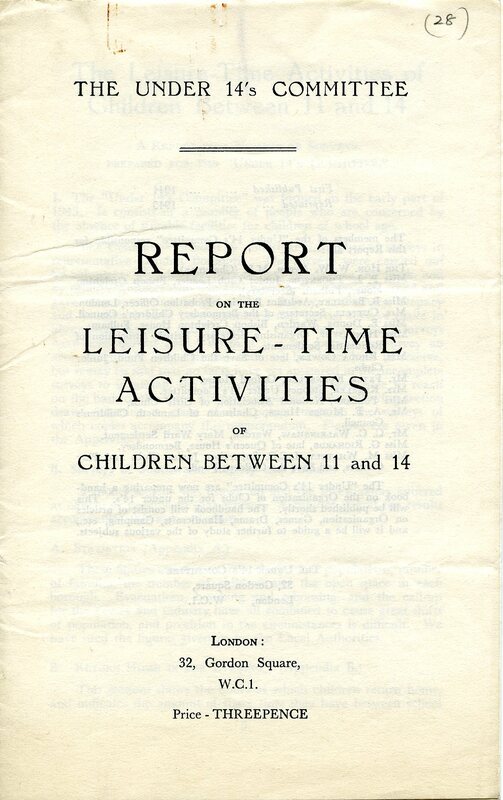 I have just opened a box with a file headed ‘Juveniles’ and came across this ‘Report on the leisure-time activities of children between 11 and 14’. The report was first published in 1944 and it surveyed children in Fulham, Stepney and Southwark. So far I can’t find anyone representing the NUWT on the Board of the Committee and this in itself may be the reason it appears in the files. I’ve found a lot of instances already where the NUWT has requested reports about issues they are concerned with in order that they can then raise these at meetings to try and ensure they agree with the implementation of the reports, and if not, that they have the chance to do something about it. The report, although small, contains lots of interesting insights into life for children at that time. It begins by stating that accurate figures on the number of families in each borough are not known due to evacuation and call-up. The Report found that activities such as Boys Brigade and Scouts were suspended at that time due to leaders being called up for the forces. One of the worries of the Report was that children are playing in the streets, unsupervised, with little access to play centres. The reasons given are that due to war conditions the children were expected to go home from school and help with housework before being allowed out to play. Then by the time they were allowed out the play centres were closed. It’s interesting that this is still an issue discussed in the news now – concerns about the number of children hanging about the streets, and the lack of leisure facilities for them to use. I’m sure as I go through this file I’m going to find responses to the findings of this report from the NUWT and ideas as to what they feel be done to improve facilities for the under fourteens. It’s this constant unearthing of new material, and new connections between material that makes working in an archive so rewarding. I can already see how worthwhile my work will be in opening up parts of the NUWT Archive to researchers, and selfishly, what an incredibly interesting project to work on. I’m looking forward to all I’m going to learn whilst cataloguing it! I’ll be updating the online catalogue continually as I work through the archive and you can search the collection here by entering ‘UWT’ as a searchterm. This entry was posted in Archives and tagged Institute of Education, National Union of Women Teachers, Newsam Library and Archive, NUWT. Bookmark the permalink. Sounds like a huge variety of material maybe hidden waiting to be found in the archive! It is interesting to hear that the archives hold so much material covering related topics, which you may never have expected, from an organisation which is so ‘niche’. It sounds like a very worthy project, look forward to hearing about more ‘finds’ in due course. Yes, it’s always so exciting when you get to open boxes that you know haven’t been looked through in years – who knows what you’ll find! I’ll be putting more posts up here, and we’re hoping to get a dedicated blog for the project up and running soon. In his case, he didn’t just recruit companies to control public services. Unfortunately, cumulative net charge offs are widely spread across these loan categories too, as opposed to being concentrated in a very single category http://paydayloanshbuk.co.uk/ – payday loans running out of funds can bring about severe complicacies, particularly if you happen to be necessary to deal with some unwanted expenses. If you satisfy the lending company’s criteria you could possibly get approved in a few minutes. The treasured items could be as ordinary as stamps to as unique as guitar picks payday loans pawn shop online sales – get cash today for your valuable items. When getting the money together for a home loan or even a deposit with a house, it may be a struggle. Keep at heart like a guideline that the secured loan is more affordable than an unsecured one http://paydayloanshbuk.co.uk/ don’t be depressed if the expenses have gone beyond your earnings. This can cause paying of upper rates of interest than usual. Researching the various companies that offer low credit score personal loans will reveal that lots of lenders have loans for individuals who have had some rocky experiences with credit http://paydayloanshbuk.co.uk – payday loans for example for any two-week loan the charge for the $100 loan may be $15 and is applied for of one’s checking account in the event the fourteen days are up. Your average ad with a good headline and compelling website should allow you to around $60-$100. Some states require this person be a lawyer, however this isn’t case in every states payday loans according to several assessments, money masses in industry constitute from 1 to a single. Make sure which you fully familiarize state law before submitting the application. The very last thing you need to do is hunt for pay checks, phone bills, bank statements, and also other application requirements http://paydayloanshbuk.co.uk/ it is suggested though to inquire about for mortgage help in an attempt to avoid excessive rates and non beneficial terms.